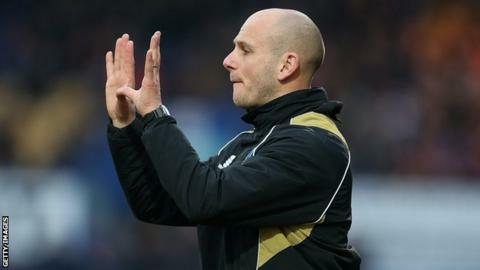 Mansfield boss Adam Murray says he wants the club to progress every year after last term's relegation near-miss. The 33-year-old, who took over in December, told BBC East Midlands Today: "Last year we were nearly relegated. We need to make sure that this year we progress and become a team. "Our aim is to progress every year as we move forward through the season. "It's not just about the team, it's about taking the club forward. We know we can be successful in this league." He added: "We have a group that is full of ambition and drive, our aim is to progress as the season goes on and we want to put this football club back on the map. "As a manger the club push me to be better everyday. I couldn't be in a better environment because it won't ever let me or the players go into a comfort zone - if you don't perform, you get told." Mansfield have made 14 signings so far this summer and drew their first game of the season at home to Carlisle. "We needed an an overhaul - we needed to bring some fresh impetus into the club, a different style and kind of player, a new energy to the group and now it's about making this team, a team," said Murray. "As quickly as you can get things moving in the right direction, the more successful you'll be so that's our aim and we've got off to a decent start, we're looking at building on that." The Stags' next league game is a local derby game at Notts County on Friday night. "We go there in full confidence, we know our strengths and their weaknesses, we need to compete and be resilient and put ourselves onto them," he added.